Someone was flying a drone near our site and watching video from it. We considered this an invasion of our privacy and also dangerous in a busy park. If he lost control it could have hit an RV and caused damage. Management showed no interest in our complaint & suggested we could leave. Without a refund! Most definitely will not stay here again. . The sites are level and the staff is friendly. Having an observatory on site is very cool. This park is situated about 1/4 mile from a double railroad track that has frequent trains on them day and night and there are several crossings that the trains sound their horns for. It is very loud and annoying in the park. NOT PET FRIENDLY AND EXTREME TRAFFIC NOISE!! I should have read the other reviews before staying here. 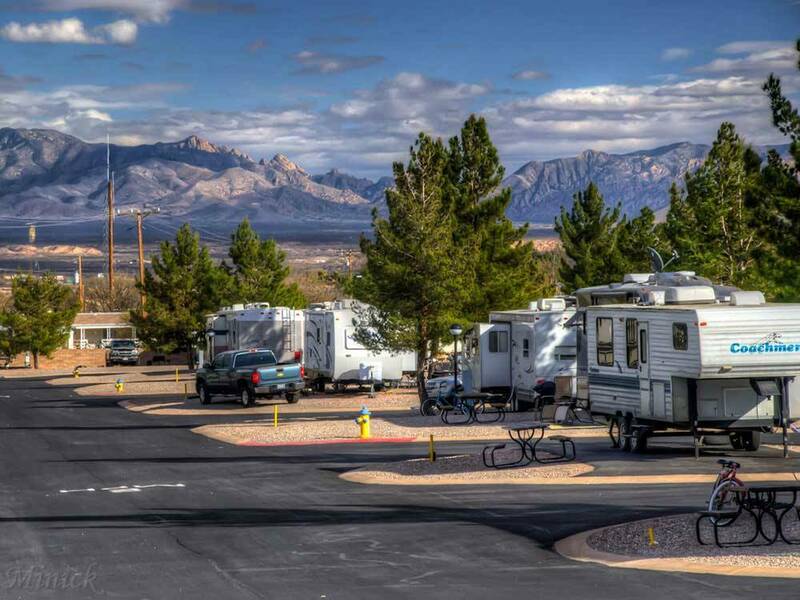 If I could change staying at Butterfield RV Resort for the 17 days we paid for a premium site, I definitely would, even making the extra miles into the Tucson area. Here are the reasons. 1. The observatory is a joke. Just a large telescope in a dome. I can see more using my binoculars. We made the 1500 mile trip and the telescope was broken waiting on parts, then a super letdown on the quality of the site when it was repaired. 2. The water pressure was so low, that we had to fill our tank every day, and use our pump to take quick showers. 3. The WIFI is so slow that you can't use it, so virtually none here. The manager said that the park was full, but its poor engineering and planning. We were 6 spaces from the office and WiFi antenna. 4. Most people travel with pets, the rules here are too stringent to be pet friendly and taken to the extreme. My dog urinated a foot into a site corner and I was disciplined and lectured even though I apologized. So, if the dog pen is occupied you better make your dog hold it. 5. The pool and hot tub were advertised but under construction, so those amenities don’t exist here. 6. This park is up for sale, possibly because it is in a HIGH train noise area. The trains run all day and night blowing their horns and car traffic is heavy so road noise is almost as bad. 7. Customer service is nonexistent, the office and park staff are not responsive. 8. MARK THIS ONE OFF MY LIST. The only reason I gave 4 starts is because of the current construction. I would have given 5 stars, since we stayed there just over a year ago. We missed the observatory the first year, this year it was cloudy and windy. So we will try again. This RV park is a first class campground. The park, sites, restroom etc are very clean and well maintained. The Observatory was a splendid experience, this is no amateur telescope folks, we're talking University grade equipment with knowledgable operators that make the experience fun, interesting and educational. The park has tons of activities each day and the other campers were wonderful people. If you're passing through or snow birding this is must do stop. We stayed at Butterfield RV Resort for a week and thoroughly enjoyed our stay. The site was paved, roads paved, nice pool and spa, clean bathrooms, and lots of fun stuff to see and do in the area including their observatory. I would highly recommend this park! Very nice park with convenient location 1/2 mile off of I-10. There is a Safeway and Ace Hardware right around the corner. Exceptionally clean campground. Very helpful staff. Did not use their restrooms, but the laundry room and workout room were immaculate. Would definitely stay there again. This is one of the nicest RV parks we have encountered to date. First class all the way, would stay here again. Easy off/on to I-10 in Benson. Near grocery store and Walmart, which is always a plus when traveling. Park is very clean and has a super friendly staff. Sites were immaculate! An added bonus is each site has a tree - something usually not found in RV sites in the desert and any shade is always welcome. Laundry mat, pool and spa are all close to sites and in great condition. Center sites are black top and clean. Didn't use the gravel but they all look nice and level too. Will definitely return to this RV site on another trip.